Home Apps Mobility as a Service: the key to seamless travel chains? Kaj Pyyhtiä, co-founder of MaaS Global, talks to Keith Barrow. NEW legislation comes into effect in Finland this month, which sets an international precedent for the availability of data on transport services. Through its Act on Transport Services, the government seeks to provide a legal basis for digitalisation and new business models in the transport sector by introducing provisions on the interoperability of data and information systems. This does away with mode-specific regulations on transport service information and provides a level playing field for all operators.The new law will allow Uber to begin operating in Finland, but like every other transport operator in the country, it will need to open its Application Programming Interface (API) and its data. It will also have to allow third party providers to buy and resell Uber rides through their own applications. The act will be a key enabler for the broader implementation of Mobility as a Service (MaaS), a concept which integrates different transport services including public transport, taxis, car hire, walking, and car, ride or bike-sharing into a single on-demand mobility service. The user accesses MaaS through a single application, which sets out the fastest, greenest, or cheapest route for any given trip with a single payment channel covering all services. As a MaaS subscriber, paper tickets and cash payments become a thing of the past – the mobile phone becomes the user’s “control and command centre” for a world of seamless mobility that is free at the point of use. As the cradle of the MaaS concept, Finland is creating an ecosystem in which integrated on-demand mobility solutions can thrive. 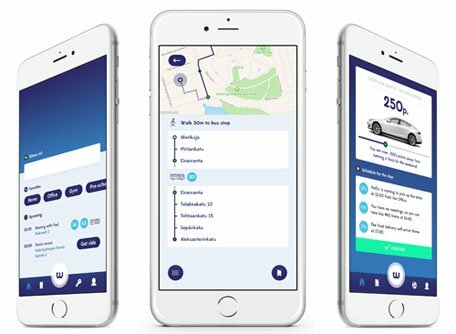 One of the pioneers in the field is MaaS Global, which launched the world’s first MaaS solution, Whim, in its home city of Helsinki at the end of 2016. According to guidelines from the MaaS Alliance, the core function of a MaaS ecosystem is to create an “open and dynamic market for the delivery of a user-centric mobility services portfolio through a unique interface,” with many different partners sharing a common principle of delivering a seamless door-to-door mobility experience. For Pyyhtiä, the key word here is “open” – a MaaS ecosystem can only work effectively in a deregulated environment where all players are on equal terms. car rental services for subscribers who need occasional access to a car. Pyyhtiä stresses that MaaS is a universal concept, and its open architecture should help it to grow quickly, potentially with spectacular results for public transport.